Last seen in 1981 and thought lost to science, Wallace’s giant bee has been rediscovered in the forests of Indonesia. It turns out that the world’s largest bee is not extinct. An international team of scientists and conservationists spotted and photographed a Wallace’s giant bee in the forests of North Moluccas, an island group in Indonesia, in January 2019. The Wallace’s giant bee (Megachile pluto) – with a wingspan more than 2.5 inches (6 cm) – is Earth’s largest. Despite its conspicuous size, the big bee has been lost to science since 1981. It was absolutely breathtaking to see this ‘flying bulldog’ of an insect that we weren’t sure existed anymore. To see how beautiful and big the species is in real life, to hear the sound of its giant wings thrumming as it flew past my head, was just incredible. The female giant bee makes her nest in active termite mounds in trees. She uses her large mandibles to collect sticky tree resin to line the nest and protect it from invading termites. In heat, humidity and sometimes torrential downpours, the team searched dozens of termite mounds in hopes of discovering a giant bee. 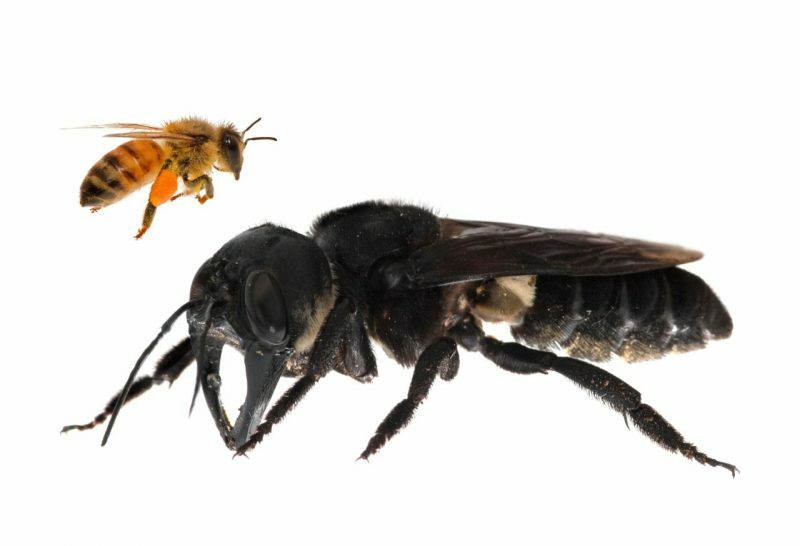 It wasn’t until the last day of a five-day stop in an area of interest that the team finally found a single female Wallace’s giant bee living in a termites’ nest in a tree about 8.2 feet (2.5 meters) off the ground. 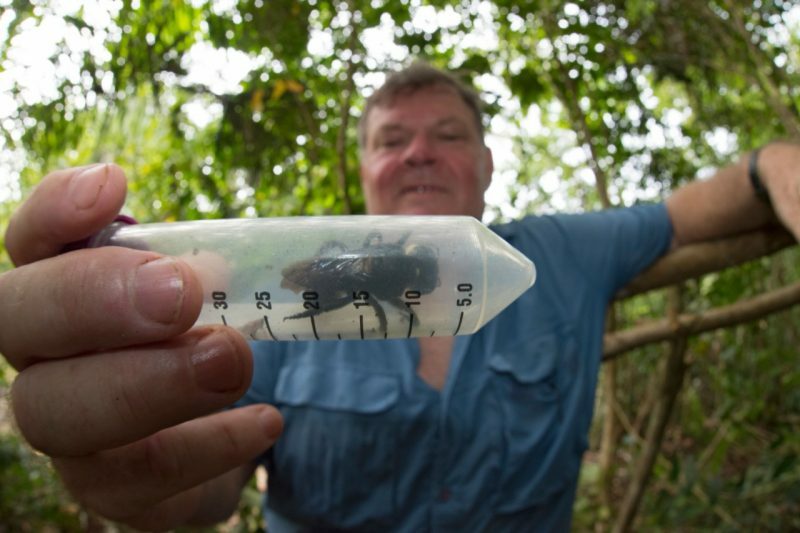 Simon Robson with a live Wallace’s giant bee in Indonesia. 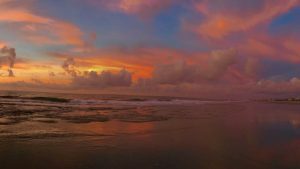 Image via Clay Bolt. … a large black wasp-like insect, with immense jaws like a stag-beetle. The bee wasn’t seen again until 1981, when an entomologist rediscovered it on three Indonesian islands and was able to observe some of its behavior, including how it uses its mandibles to gather resin and wood for its nests. Since then, other teams have looked for the bee, but with no luck. 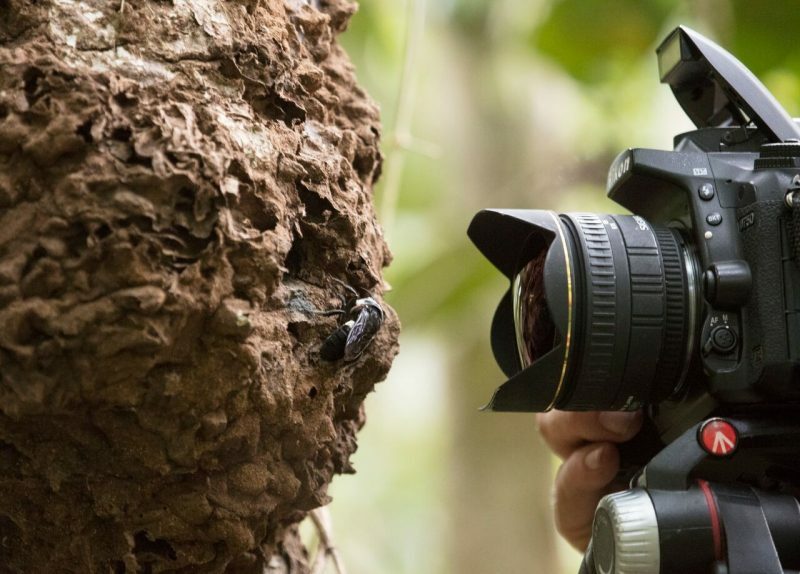 Natural history photographer Clay Bolt makes the first ever photos of a living Wallace’s giant bee at its nest, which is found in active termite mounds in the North Moluccas, Indonesia. Image © Simon Robson. Amid such a well-documented global decline in insect diversity it’s wonderful to discover that this iconic species is still hanging on. Although little is known about the bee, the species depends on primary lowland forest for resin and the nests of tree-dwelling termites, Bolt said. In Indonesia, forest destruction for agriculture, however, threatens the habitat for this species and many others. 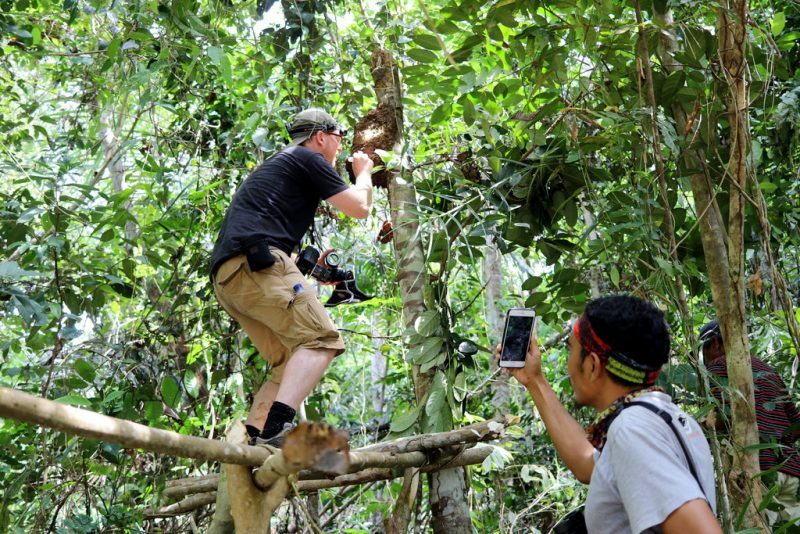 Photographer Clay Bolt, left, and a guide, Iswan, photographing the bee’s nest in the North Moluccas of Indonesia. Image via Simon Robson/New York Times. Bottom line: Researchers found and photographed a Wallace’s giant bee – the world’s largest bee and feared extinct – in Indonesia in January 2019.